NEWS RELEASE SAULT THEATRE WORKSHOP ************************* SAULT STE. SAULT STE. 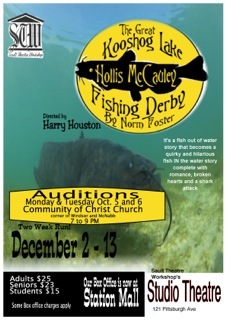 MARIE, ON - The Sault Theatre Workshop is excited to announce audition dates for its December show, The Great Kooshog Lake Hollis McCauley Fishing Derby, by Norm Foster, directed by Harry Houston. Auditions will be held at the Community of Christ Church located at 585 McNabb Street in Sault Ste. Marie, ON from 7-9 p.m. on Monday, October 5 and Tuesday, October 6. The Great Kooshog Lake Hollis McCauley Fishing Derby is set in Lake Kooshog (surprise) where puffed-up, overachieving investment advisor James Bell has had the grave misfortune to have his car break down while on his way to give a ‘very important’ speech. The multi-talented locals (the whole town plays the harp, for one thing) really would like to help him on his long-winded way, but fuel pumps, like certain fabled fish, can’t be easily had. They have to be ordered in from somewhere else. James is invited to take part in the annual fishing derby while he waits. This production requires three female and two male actors. Rehearsals are slated to begin in mid-October, and this production will run for two weeks, spanning from December 2-6 and then again December 9 -1 2015. For more information, contact Harry Houston at 705-946-4081 or visit www.saulttheatre.com for more information on our upcoming season! The STW was established in 1948. We are proud to have been presenting quality theatre in Sault Ste. Marie for over 66 years.